We walk past them every day, often in too much of a hurry to really notice them. Even when we do take the time to admire them, most of us don’t truly understand their importance. That’s because the sculptures scattered around the Long Beach State campus are more than just decorative artwork. Many broke new ground in sculpture when they were installed. That’s particularly true of the nine works that were brought to campus for the 1965 California International Sculpture Symposium. The first of its kind in the United States, the seventh worldwide, and the first on a college campus, the symposium resulted in nine monumental modernist works of art. It was featured in The New York Times, The National Observer, Los Angeles Magazine and Arts & Architecture, along with other publications. 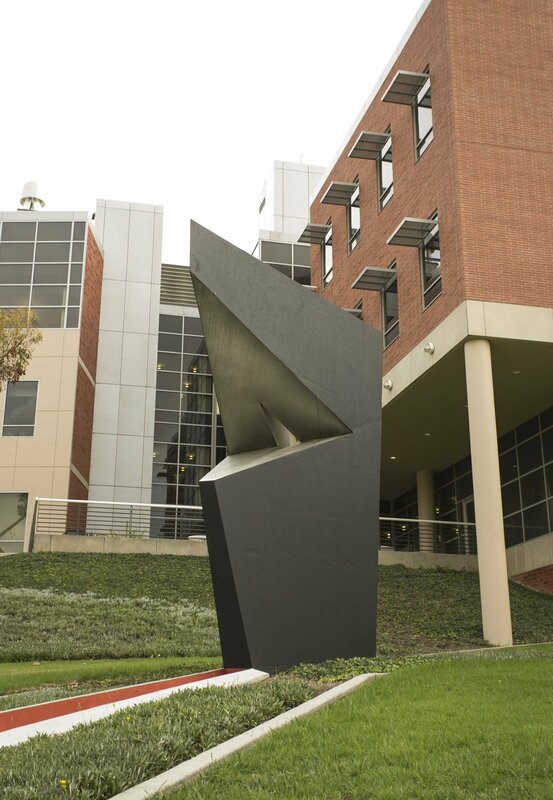 It led to more art installations over the years, forming the basis of what is now known as the CSULB Outdoor Sculpture Collection. 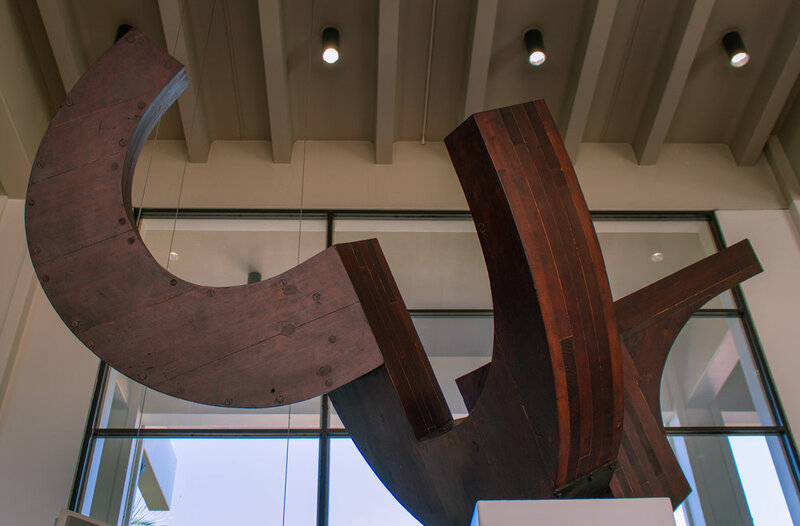 Weather and time took a toll on the 1965 collection, so in 2014, the University Art Museum announced a formal collaboration with the Getty Conservation Institute to conserve the sculptures. Since then, they’ve completed six conservation projects, and a seventh project is under way. Rosa Lowinger, a respected objects conservator and the head of RLA Conservation of Art and Architecture, works with scientists from the Getty and UAM’s researchers to create treatment plans for each work of art. The projects, which are mainly funded by grants from the Long Beach Navy Memorial Heritage Association and the Institute of Museum and Library Services, take months, and sometimes even years. Because the works are so large, they must be conserved on site, which creates some interesting challenges. Here’s a tour in photos through the nine works created for the 1965 symposium. Gabriel Kohn used the traditional methods of a master carpenter to create Long Beach Contract from laminated redwood. The abstract geometric form was the artist’s first large-scale work. Fabricated at the Fellows and Stewart shipyard in Long Beach, it has been shown at the Los Angeles County Museum of Art and the Metropolitan Museum of Art, New York. Duet (Homage to David Smith) by Robert Murray is a sculpture composed of three sheets of one-inch-thick steel, carefully balanced against each other to form a geometric shape. The pieces were fabricated at the Bethlehem Steel shipyard in San Pedro. Originally painted a soft yellow, the sculpture was repainted several times over the years and was a deep red shade when the Getty Conservation Institute began restoring it. Now, it is painted in a shade closer to its original color. The white bell tower located in the center of the quad near the science buildings is Andre Bloc’s Carlson/Bloc Tower. Bell towers have been known as a symbol of communication and were constructed by many universities in the 19th century. Throughout the day, music can be heard from the bell tower through speakers installed on the top of the McIntosh Humanities building and in other locations. Kengrio Azuma’s MU 484, an etched, engraved and anodized aluminum column, signifies the intersection of three principles: earth, man, and sky. It weighs close to 3,000 pounds and has been moved twice since it was installed for the symposium. Since 1984, it has stood near the western entrance to campus on Bellflower Boulevard. 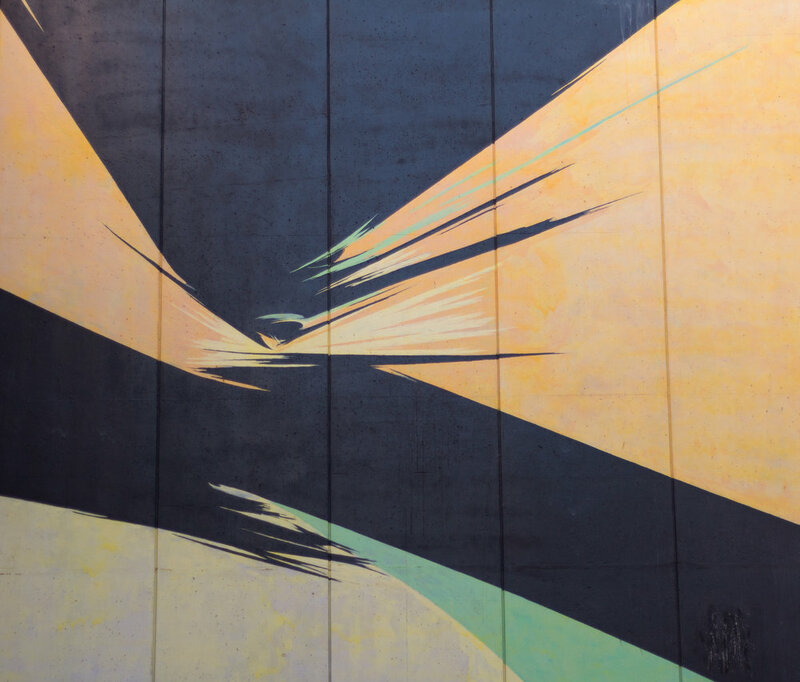 Canadian artist Rita Letendre’s mural Sun Forces, painted on the corridor adjacent to the LA-1 building, is an important piece to the North American mural movement, as outdoor wall paintings were rare at the time of the symposium. The Long Beach Navy Memorial Heritage Association recently provided a grant to conserve the mural, and this summer, microscopic samples of the paint were taken to the Getty Conservation Institute in Los Angeles to be analyzed in preparation for restoration work to begin in the summer of 2019. Claire Falkenstein’s ‘U’ as a Set was designed to adorn the flowing pool of water outside the McIntosh Humanities building. Made from twisted copper tubing tangled into a dramatic, unconventional shape, it was fabricated on site with the help of a group of Long Beach State students. Dutch artist J.J. Beljon dedicated Homage to Simon Rodia to the artist who created the Watts Towers in Los Angeles. Installed at the corner of Seventh Street and East Campus Drive, it consists of 19 white concrete elements that cover 130 feet. To create the imposing structure, workers poured 260 pounds of cement into wooden forms. A Long Beach Navy Heritage Association grant allowed conservation work on the sculpture in 2015. Hardfact by Kosso Eloul, a concrete and stainless steel monolith attached to a painted concrete wedge cut into the grassy knoll behind the Hall of Science, presented some issues during construction, as a narrow piece at the back portion of the mouth caused the sculpture to collapse a couple of times before it was completed. Now by Piotr Kowalski, a curved stainless-steel sculpture next to the University Student Union, was one of several pieces in the symposium to use new industrial materials and new technologies in its construction. In collaboration with North American Aviation, Kowalski used underwater dynamite blasts to create the unique shape of the three panels.